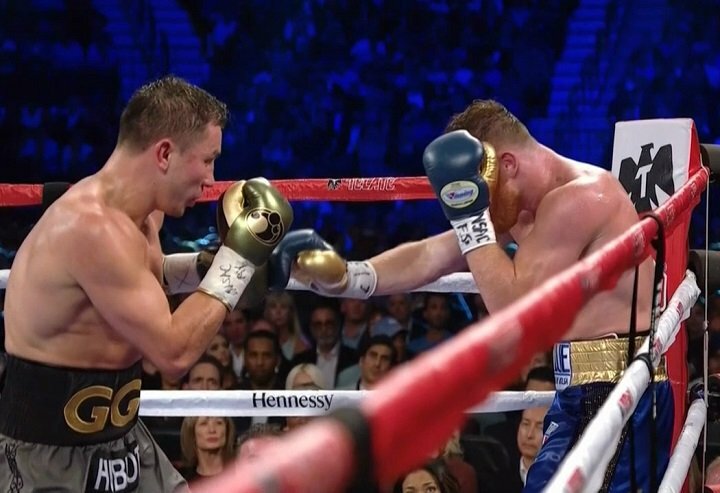 By Sean Jones: Saul ‘Canelo’ Alvarez (49-1-2, 34 KOs) failed to show that he could fight IBF, IBO, WBA & WBC middleweight champion Gennady ‘GGG’ Golovkin (37-0-1, 33 KOs) in sustained manner for 12 rounds to win their fight last year on September 16 at the T-Mobile Arena in Las Vegas, Nevada. Golovkin’s trainer Abel Sanchez thinks Canelo will try and fight harder in the rematch (if there is one) to impress the judges enough for him to earn a decision. However, Sanchez questions whether Canelo can fight hard enough for a full 12 rounds for him to get the victory. It’s all well and good for Canelo to fight in brief spurts followed by long periods of resting, but that’s not going to work for him to win a 12 round fight against Golovkin, who will be applying unyielding pressure for the entire fight. Canelo did have his moments in each of the round, but he was unable to keep up the pace due to his conditioning. The 27-year-old Canelo didn’t have the stamina to fight hard enough to keep up with the older but much fitter 35-year-old Golovkin for 12 rounds. The judges scored the fight a 12 round draw. In predicting how Canelo will fight Golovkin, it’s impossible to imagine him being able to break from his normal pattern of fighting in brief periods of activity followed by a minute of rest. That’s been Canelo’s pattern of fighting since he was 19-years-old. Canelo doesn’t have any control over the way he fights. In other words, Canelo fights in spurts and then he needs to recover for 1-2 minutes. If Canelo goes all out and throws a lot of punches, he’ll fade immediately and be helpless. The harsh reality is, Canelo can’t afford to gas out against a puncher like Golovkin, because he’d be knocked out by him right away. It wouldn’t matter how much head movement Canelo uses. If he gasses out against Golovkin, he’ll be sliced and diced like he’s caught in a blender. You have to understand that Golovkin is nonstop puncher, and he doesn’t need rest breaks like Canelo and other similar fighters with poor stamina. If Canelo changes the way he fights by fighting for a full 3 minute round, he’ll turn red in the face and be vulnerable to anything Golovkin throws at him. The stamina isn’t there for the 27-year-old Canelo for him to increase his punch output in a significant way in the rematch. Canelo literally is forced to fight in spurts because he’s not build to fight the way Golovkin does. That means we’re probably going to see Canelo running when he gets tired in the rematch. Canelo will rest 5 to 10 seconds against the ropes, but then he’ll start running to avoid getting too many of GGG’s jabs. Canelo will have no choice. If he stays with his back against the ropes, he’ll get embarrassed by Golovkin, and possibly knocked out. Canelo can’t force his body to do something that it’s not build to do. Canelo can’t improve in the rematch with Golovkin. All Canelo can do is try the same things he did last time by fighting in spurts, and hope that he has similar scoring as last time he fought Golovkin. If there’s judges that are assigned to the fight that are fine with Canelo being gassed out after 1 minute of activity in each round, then they’ll give him the rounds. It’ll look bad in the eyes of the boxing fans to see Canelo outworked again and dominated, but this is boxing. The judges control who wins and who loses when it comes to fights that go to the scorecards. “Canelo may fight a different fight net time where better body punching can be exhibited from both sides,” said Sanchez. “I think Canelo goes to the body really well too, but he’s got to be there in order to do it. Somebody may catch somebody. You never know. Canelo is a great puncher also. Golovkin has never been down or never been hurt, but who knows? Anybody can be hurt if they’re hit on the chin,” said Sanchez. Canelo has to want to stand and fight Golovkin for the fight to be an improvement over the last one. Canelo fought in a safety-first manner against Golovkin last time. It was clear from the opening seconds of round 1 that Canelo didn’t have the confidence to stand his ground and fight Golovkin. So instead of Canelo being stationary and fighting in a war like he said he was going to do pre-fight, he got on his bike and ran from him for 12 rounds. Golovkin had to cut off the ring to force Canelo to trade with him. Golovkin should understand that there will not be any major adjustments from Canelo in the rematch, because he cannot fight in a different manner than he did the first time around. The reason why Canelo won’t stand and fight Golovkin in a stationary manner is because he doesn’t have the engine to fight hard for 3 minutes, and I believe that he’s short on the COURAGE needed for him to slug it out. So, we’re going to see Canelo try and adopt a Mayweather-esque approach to fighting Golovkin in the rematch by him running and fighting in spurts. It’s going to be very boring unless Golovkin can cut off the ring to make Canelo fight him.